Get twice the action with the Pain and Gain + Italian Job double-feature. 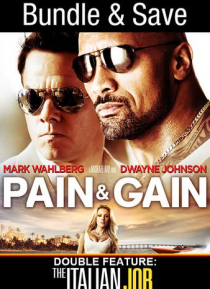 In Michael Bay's hilarious action comedy, Pain & Gain, an ambitious group of personal trainers (Mark Wahlberg, Dwayne Johnson and Anthony Mackie) go after the American Dream, only to get caught up in a criminal enterprise that goes horribly wrong. Now, living large will take everything they've got in this unbelievable and ou… trageous true story. Then in The Italian Job, Charlie Croker (Mark Wahlberg) pulled-off the heist of a lifetime. When he's double-crossed, he wants more than the job's payoff...he wants payback!